This week we were treated to the college baseball weekend starting a day early, as many teams started their weekend series’ on Thursday. #13 UCLA @ #22 Stanford – A rare bad outing from possible #1 pick Gerrit Cole led to a Bruins loss at the hand of the Cardinal 7-4. Gerrit Cole – RHP – UCLA – Jr. 6.1IP 9H 6ER 1BB 1K. (L, 4-4). Losses happen but one K against a young Stanford lineup is curious. 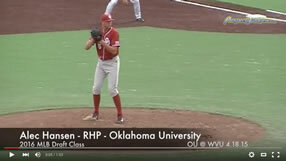 Tyler Anderson – LHP – Oregon – Jr. 9IP 3H 2ER 1BB 9K. (W, 6-1). Impressive in win over Arizona. Brady Rodgers – RHP – Arizona St. – So. 7.1IP 4H 2ER 3BB 4K. Andrew Triggs – RHP – USC – Jr. 9IP 5H 1ER 1BB 10K. (W, 3-3). Erik Johnson – RHP – California – Jr. 9IP 8H 2ER 3BB 2K. Cal lost in 17 innings despite great outing by Johnson.